NOTE: until version 1.0.0 the API may change! The Client class provides a unified pubsub client in Node.js and browsers. It supports subscribing to topics or topic patterns (topics and wildcards). Clients can connect to brokers or bridges that support the client.adapter’s protocol. In some cases, clients should not connect directly to a message broker. 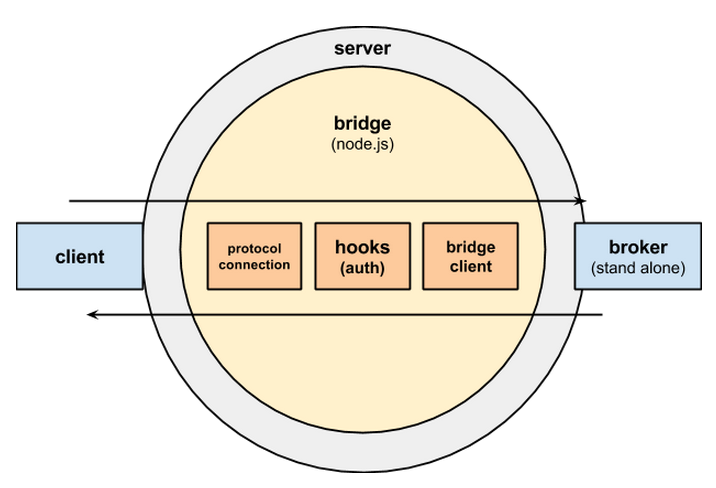 The Bridge class allows you to create a bridge between a client connecting to your node.js server and a broker. It supports hooks for injecting logic before the bridge performs an action on behalf of the client. Hooks allow you to implement client authentication and client action (publish, subscribe) authorization using vanilla node.js (usually in place of broker specific access controls and authentication). Bridges also allow clients to connect to brokers over a protocol that the broker may not support. For example, a client can connect to the bridge using one protocol (eg. MQTT) and the bridge will connect to the broker using another (eg. Redis or STOMP). Note: It is not possible to guarantee all features when bridging connections of one protocol to a broker that speaks another protocol. For example MQTT quality of service (options.qos) will be not be guaranteed when a bridge is accepting MQTT protocol connections and bridging to a redis broker. Here is an example setting up a bridge. This would bridge messages between MQTT clients and a RabbitMQ server. This example shows how to connect a Client to a Bridge and then a Bridge to a broker (using another Client). To distribute a message published to a topic, a client connects to a message broker. Client adapters allow pubsub clients to connect to various brokers. Clients can connect directly to brokers or indirectly using a bridge. Client adapters implement the Client API in a broker protocol-specific way. Specify the adapter specific options using the name as the key. It is possible to extend strong-pubsub to support other protocols, but that is beyond the scope of this README. Adapters / Clients require a tranpsort to create a connection and read / write data to / from. A module (or object) that implements net.createConnection(). This example shows how to switch betweenn different transports on the client. A Protocol connection implements a specific pubsub protocol in Node.js for use by strong-pubsub-bridge. This diagram illustrates how messages flow between clients, bridges, servers and brokers. The blue arrows represent a message published to a topic. The green arrow represents the message being sent to a subscriber.